Its the shortest day of the year today, here in the southern hemisphere anyway. Its calm after the mayhem that yesterdays fast moving winter storm caused, and while there is some light cloud its mostly sunny. The significance of the day though is that springtime, warm weather, boisterous early season breezes and the promise of summer is just a couple of flips of pages on the calendar away. Maintenance, lots to do. Haul, antifoul and paint my ship. 40 ft. of motor cruiser is a lump of a thing to do, its three years since the last one, the first since I bought her, and she not only needs her bottom done but the topsides are looking tired as well so it’s a big job. I do manage to keep the worst of the barnacles off her, have several times put her on a sandy beach an hour before low tide and walked around with a hard broom to scrub and scrape, an hour means the water goes down about a foot so she leans over just enough for me to get well under with the long handled broom, but she’s about through the soft antifouling paint under there so its up on the hard when I get back from the next trip. Same with the little yacht “May” as well, living on a trailer she is not antifouled, but there is much maintenance to do there, even under her sheltering tarpaulin the varnish has peeled and some of the paint cracked, the interior is musty and there is a bit of mould, the rig needs attention and, well, more work. I want to cruise her this summer, so its time to make a plan. Paint, paint rollers and brushes, thinners, scrapers, sandpapers and sanders, scrubbing brushes, all the tools and materials need to be assembled ready for the big days, the ship will be done in one intense weeks work up on the hard, two ladders, a scaffold plank, mask, tyvek suit, gloves etc. I’m not looking forward to that but little “May” can be done a bit at a time. Sanding, varnishing, and as the warmer weather dries out the lawn up where she is parked I can take the rig down, assemble it on the grass and make the changes I want. So there is a shelf and a toolbox up there in the boatshed, devoted to the spring maintenance. The toolbox has all the sanding and painting gear plus protective clothing, one end of the shelf has the paint and varnish for the little yacht, the other for the ship. I’ve got quite a lot of it including $450 worth of antifouling, but there is more to get. I’ll go and see my friend at Burnsco the boat chandlery about that, but am sorry that they don’t sell bulk elbow grease. I’m going to need some. But today I’m going to fit the rowlock plates to SEI. Nothing fancy this time, she’s not a boat that I anticipate rowing for hours at a time, so I am not going to fit my “patent” tufnol lined sockets, just a bronze strap top and bottom of a hardwood block, drilled to suit the rowlocks, and through bolted. The hardwood came from a shipping pallet, its oily wood, hard, I’ve no idea what species but it is very tough with interlocked grain that should wear well, and like everything else for a serial boatbuilder it was there when I needed something so that’s what got used. I’ve oars to build for her as well, they’ll be long ones at 9 ft. Again they’ll be simple with narrow blades that wont need to be feathered when rowing to windward and be sturdy enough to push the boat off with. Stowing a pair of 9 ft oars in SEI is going to be a pain, they'll be either in the way or hanging out the end of the boat, I'm thinking of getting myself a pair of Chuck Leinwebers clip together oar sleeves, this will allow me to make the oars at the correct length, then cut them in half and with these sleeves, clip them together when needed. I have been using a pair of his paddle ones, and they're very good, those allow me to use the paddle at my usual 45deg left handed configuration and my visitors can use them just straight which is easier than feathering, allows them to concentrate on no falling out. The oar ones are shown "Here". I've lots to do before springtime. Not a lot of time in which to do it! On the 14th of next month I’m on the plane again for what has become an annual pilgrimage to Port Townsend in the USA. It’s a long trip this time, so my spring will be spent travelling rather than doing all the work that’s stacked up at home. All of the above adds up to the fact that its time I got out of my nice warm bunk and got on with it. I love camp cruising, began my cruising career in a then 40 year old open 14 ft sailing dinghy with a damp kapok sleeping bag, a very old and temperamental kerosene stove, two spoons, a can opener and a bucket. We had a tarp which got slung over the boom, and generally tried to get the boat up into the head of the harbours or estuaries where she would settle fairly upright on the mud overnight. We had no outboard motor, no cellphones of course, and were frequently late home. Not just an hour or two, sometimes several days! If we could we’d find a phone box and ring one or the other set of parents knowing that whichever we’d talked to would phone the other. I recall one trip where we were trapped about 40 miles from home by a change in the weather that brought a headwind too strong for us to handle, a headwind that stayed for days, so we eventually caught a bus home, sitting alone at the back to spare people the smell of our unwashed selves. A week later, bathed, laundered, rested, carrying a bag of food and praying for for a change in the weather we caught the bus back, dragged our little ship out of the mangroves and sailed her home. My friend and I were 15 years old, parents and school seemed ok with our disappearing for a few days now and again. Great memories, but these days I prefer to be a bit more comfortable. Dry, warm, better fed, and with space to lie flat, stretch out and sleep well. I still get to go camp cruising. I very much enjoy it. A week in a small open boat brings me so much closer to the elements than other forms of cruising. Sometimes I’ll camp on shore, but of late the pressure of housing being built in even the far reaches of the harbours means that many of the little spaces that were so suited to pitching a tent are no longer available, so I build and play with boats that have a sleeping space built in. I prefer to stay dry, properly dry not just less damp than usual, so a decent shelter is part of the equipage. Its a somewhat fraught subject, there is much debate as to what fabric, what configuration and how to do the detail work. As my next build is to be a serious open sail and oar cruiser I watch for debate on this subject in the hope that I’ll pick up some useful ideas. 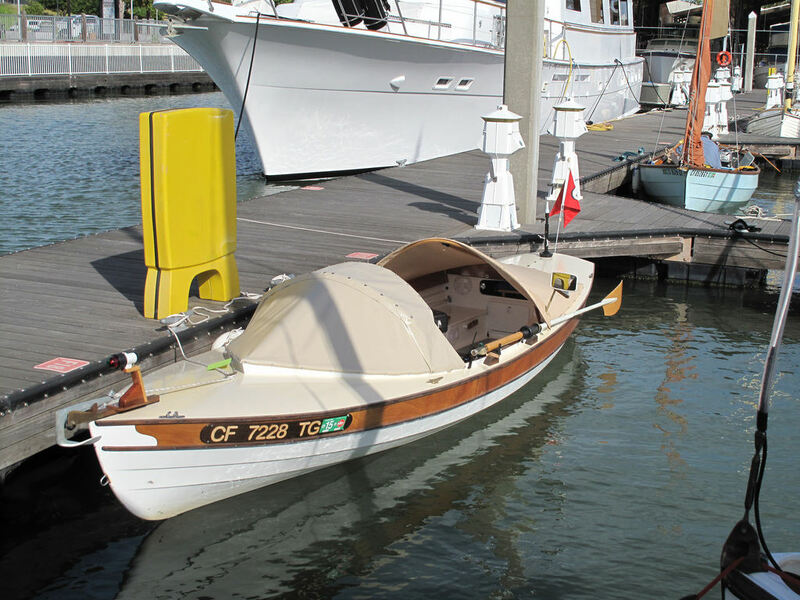 Rick Thompson built one of my Walkabout sail and oar cruisers in a rowing only version a while back, has done an exceptional job on the build and has been very active both in using the boat and in participation in internet forums. I was very interested to see his posting over on the WoodenBoat forum on his building of a quick erect tent for his boat, he’s meticulous in both research and methodology, and his tent is one of the best I’ve seen. I’ve borrowed a couple of his pics and posted them below, nice work Rick, thanks for posting that information. Go and have a look at the thread for the detail on how it was done. A grumble and other things. Just recently over on the jwbuilders yahoo group, there was some discussion about temporary shelters in which to build a boat. There were some good suggestions, and some that don’t apply here in NZ, but one of the things that came up was a reference to the very cheap kitset garages and carports available from several distributors of same. I’m back home on board my ship again after a couple of days at my Ex’s house. In exchange for another consideration I had volunteered to assemble a kitset garage that she’d bought. I’d hoped to use the completed space to get a couple of projects done, ones that are not easy when out in the weather here in New Zealands winter but that hasn’t worked out well. In the little time that I’ve been able to put into it, I’ve put the foundations in, got three walls assembled and stood up, have a little of the roof on and have decided that it was not going to work the way I wanted. It’s a nightmare of a thing to build, its so lightly framed that getting it straight and true is very difficult, the whole thing is in my humble opinion so light and flimsy that its not a good deal at all. In fact upon asking around I’ve come across several other people including two who build this sort of thing for a living who are of the same opinion, so if you’re looking for a shed, I’d suggest that look very hard before you make your choice. So I’ve bought a heap of cheap 45 x 70 framing lumber, drawn plans and today made up five roof trusses. Harder work physically than I’ve done for a while, but they are done. In a week or so I’ll be back and will pre cut all of the studs and plates for the walls, and if the weather (dead of winter here in the South) co operates will have the old structure down and stripped, the idea being to put the wooden frames up and clad them with the tin from the kit. She’ll have a decent garage in which to put her little car, and I’ll have the use of my old shop again for 12 months. The shop here where I am living is nowhere big enough for all the machinery I have in the old shop and I’ve nowhere else to put it. I’m ok with that for the most part but gosh I miss that big bandsaw. And the buzzer (jointer). And the big Drill press. And the thickness planer, and the dust extraction system, and and and – Oh well, I think that its time to get the kayak out and go for a paddle. Design wise, John Owens of JOWoodworks www.jowoodworks.com is working up a prototype for a kitset version of SEI, and today I am going over the plans and the hull of my own boat to get the “as built” measurements into the plans. I’d tried on the drawing to pinch the hull slightly midships to reduce the length of oar required to row her easily, but the planks would not easily take that shape. Another demonstration of the old engineering saying that goes “in theory there is no difference between theory and practice, but in practice there is!”. So I’ve a little work to do. 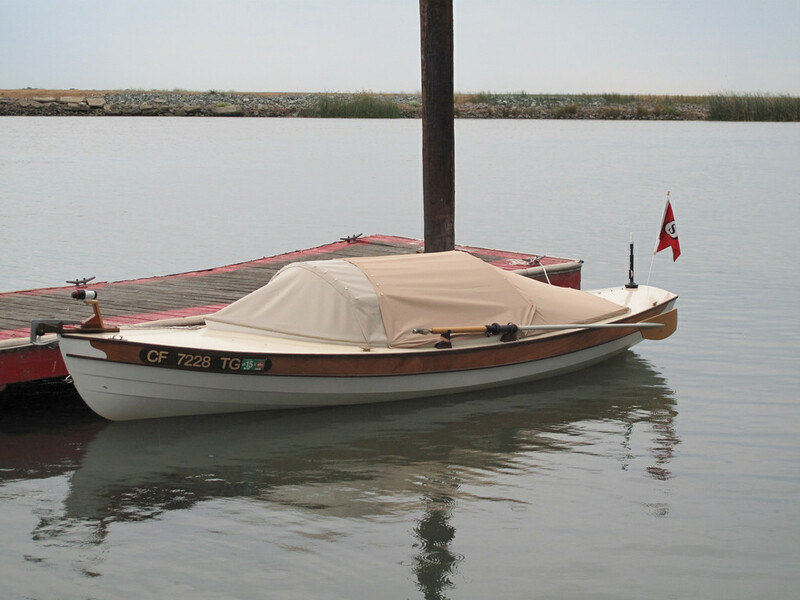 John Owens is hoping to have that boat at Sail Oklahoma and the Port Aransas PlyWooden Boat show, see you there. About subject matter on this blog. It was originally started as a place for me to chat with my friends and some of those who are building from my plans, and its been going for quite a while now. Readership is fairly high, around 5 or 6000 page views a month and its been useful to be able to refer people to posts where I’ve already written on a particular subject. On reading through the statistics, I note that the posts that attract the most readership, are those on somewhat technical matters. Some on boats, some on machinery or tools, and some on design. Understandable, so I’ll be working on that in future, more tool tests and I have a couple of interesting ones coming up, as well as more design work. I’m still trying to put up a post each Friday, but don’t bet on it, sometimes life gets in the way. It’s a long way home from Vancouver to my ship in Auckland, Skytrain in Vancouver (great public transport, quick, quiet and cheap! Well done Vancouver BC) then a flight to San Fran, (very nice airport terminal by the way, so much better than LAX, in future I’ll be paying the slight difference in airfares to avoid the latter) then the loooong 11 ½ hour flight across the Pacific, then two buses and a 2 km walk towing my suitcase. 25 hours in all. You have no idea how glad I was to walk up to the crest of the hill and look down on the river! Just a comment on airline comfort, Air New Zealand now has seats where a family or friends can fold the oversized leg rests of adjacent seats out to make a couch. Behind me there was a couple with a young child, and they were able to get much more comfortable than is usual in cattle class. I was super lucky on this flight and was the only one in a row of three so was able to lie down flat, got some “real” sleep which makes a big difference. Recommended, even if you can’t get an empty row those seats are better than any others I’ve seen. Other than that, I watched (again, for about the fifth time) the first two episodes of “The Hobbit”, noting all the places in the scenery that I know and have been to. Its an odd feeling watching a fantasy movie and recognising the mountains and the hills in the background, fun though. I made it through the trip in fairly good shape which is a relief, a couple of trips ago I would not be fit for much for a week or more afterward but today I’m good. It will take a day or two to reset the sleep cycle, but today I’m going to be working on the drawing board some, have to do some lawnmowing, will be off up the river in the kayak for my excersize run for the day, and will be putting the mast box into SEI. There is not so much to do to the little boat now, and I’m determined to get her in and sailing in time for our summer. I miss sailing small boats, they give a feeling of connection to the water that bigger boats don’t, and its been a while since I had a boat that I could sail on impulse, my little gaff sloop takes an hour from arriving at the ramp to sailing, and an hour to pull her out and unrig her. Much too long for a sail after supper, but SEI will take maybe 10 mins, less if I leave the rig set up and just bundle the sail and spars. Note that the rig fits in the length of the boat so its all “inside” when being transported, I trimmed the mast by about 100mm and altered the plans to do this, makes things much easier. Nice sails, very well made, and super well priced! I expect to be able to put up a post telling all about performance and set, but from what I have seen so far I’m impressed. Its dead of winter here, the shortest day is only two weeks away, we lose another four minutes out of an already short day, dawn is about 7 30 am, and sunset about 5 15pm. Yes I know its not anything like the UK or the Northern states, Canada or Scandinavia, but its still wetter and colder than summer, so its heater on so the pens will work, and sitting at the drawing board with my dog curled up asleep in the warm. Nice, I don’t mind the weather at all.